The first step in any interior design project is what we in the field of architecture call ‘Programming‘. That’s where we ask you about your operation, your aesthetic inclinations, how many people will do what and where, etc. But actually, there is a step before Programming. It’s kind of like the prologue to the book you just started reading (of course you read the prologue, right?) The prologue to Programming is the budget discussion. Unfortunately, many clients are hesitant to divulge this information, thinking that if they keep it a secret we will do a better job of designing on the cheap. It doesn’t work that way folks. Construction is big, expensive business and good design does not make it more expensive. Good design makes an expensive construction job worth the money you just spent on it. Keeping your designer in the dark about your budget will end up costing you more in fees and a lot more in frustration and relationships. 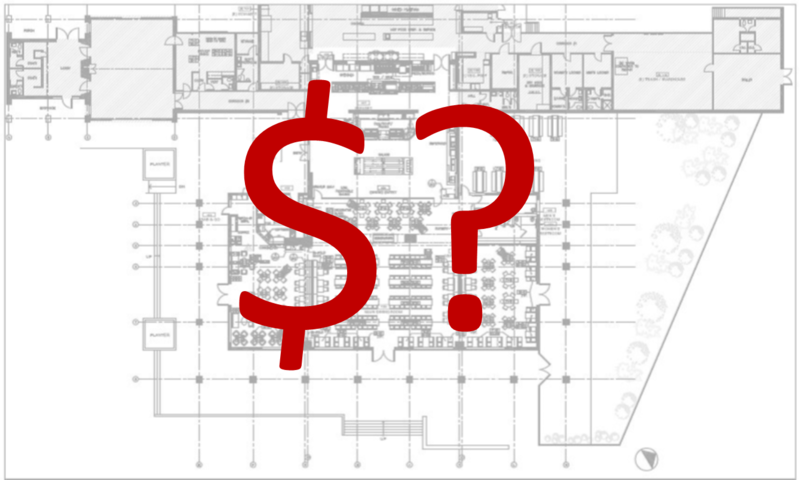 If you don’t know what your budget is, or should be, your designer/architect can help. Construction is booming in most areas and most sectors right now. That’s great news on a lot of fronts. What it means to you the client, however, is that prices are probably moving in an upward direction. So managing your budget is more critical now than ever. And the first step in managing your budget is determining a realistic budget. If your budget is not realistic you will end up spending money on fees to no avail. I had a client a few years ago who was convinced he could open a frozen yogurt shop for $150k. He priced equipment at something over $50k (remember, it was a few years ago), his inheritance was $100k over that, so peachy. Let’s quit being an IT guy and open a yogurt shop. The good news was that he had a budget in mind. The bad news was that it was not enough for what he wanted to do, and I gently told him as much. He spent a lot of time researching properties until he found one that he felt he could afford. We had already discussed his budget and that it would not cover his needs, but he was pretty determined. So we laid out the space, included minimal cost finishes, and got it priced. Somewhere in the neighborhood of $250k. Due to building, fire and health codes, some of the things that cost the most could not be left out (a restroom for example). Needless to say, he’s still an IT guy with a broken dream and a little less money in his pocket. Before you pay for design services, pay for some really good advice. Talk to a designer/architect/contractor, lay out your ideas and let them help you determine if you can afford the project you are dreaming up. Do your research. And believe what you learn. That old saying ‘don’t confuse me with the facts’ is a very expensive way to go about business. Rider Levett Bucknall is a giant in the construction management business and they put out a quarterly report that includes cost per square foot in several sectors and several areas in the US. According to their Q3 2014 report, construction costs are increasing, in some markets as much as 3% (ouch Honolulu) in one quarter. Use their numbers to estimate what your construction costs might be. And remember, construction is only part of the picture (more on that below). However you come to your budget, share it. Sing it to the heavens and make sure that everyone involved is clear on the budget you have in mind. Work with your design team to understand how your budget will be spent. There are several big pieces that need to be considered. Your design team and your general contractor will work together to keep an eye on budget. All information except owner costs will be accessible to them, so you will need to share that piece. And remember that there should be contingencies in every section of your budget. Especially in a remodel. You never know for sure what’s behind that wall….can we all say asbestos? So make sure that as you move through the project and check and re-check the budget, that you haven’t sped through your contingencies and are now seeing your budget in the rearview mirror. Indecisiveness, decisions by committee, scope creep and changing your mind are all okay, but they all have a price. So if budget is more important than adding another fireplace, keep that in mind when you discuss changes. And when decisions are needed, make them promptly. Then stick with them. Unless a poor decision will create an operational nightmare, weight the cost of changing your mind against the cost of living with it, whatever that means. Check with your design team and general contractor about the cost of every decision if you are unsure….they can help you weigh the options. There, now we have had the least romantic discussion we will have on your project. Let’s get on with the fun stuff! https://i2.wp.com/leslielaskinreese.com/wp-content/uploads/2015/01/cost1.png?fit=1339%2C803 803 1339 Leslie http://leslielaskinreese.com/wp-content/uploads/2015/05/logo15.png Leslie2015-01-22 18:27:192016-08-03 21:49:43sing your budget out LOUD! Like where your going with this, but might throw in a few ‘qualifiers’. First, just as we as designers don’t like being asked what our ideas are going to cost until we have had some time to develop our information and check product availability, cost and installation – our clients often don’t have a good understanding of what their budget needs to be. But. they often know what they ‘should’ spend. They have every right to keep that ‘should’ a secret. It doesn’t hurt as much as you seem to portray. A true budget just takes time to develop, and involves much more than just first cost. I jumped to this article because I enjoy reading opinions about programming and planning as key first project drivers. They absolutely are. Budget, yes… its critical, but it can be a surprise and still be attainable. Some great designs start with unlimited budgets and get done for peanuts, when you relate them to what they ‘should’ have cost… due to good design. Thanks for checking in Bill…maybe ‘booming’ is just what is happening in my area, but according to RLB, construction is definitely growing in most markets. As to the secretive budget, part of my job as a commercial designer is often to help my client determine both needs and budget. That can only happen when we are both clear about objectives and what they ‘should’ spend. If what they ‘should’ spend won’t cover the cost of their project, they are better off not starting until they either modify objectives or find another revenue source. Otherwise they waste money on fees that they can’t get back. It’s in their best interest to be clear and open on this point. Perhaps it is different in other market segments (non-commercial)…there I have little expertise.